by Damrosch, David; Dettmar, Kevin J. H.; Baswell, Christopher; Carroll, Clare; Hadfield, Andrew David; Henderson, Heather; Manning, Peter J.; Schotter, Anne Howland; Sharpe, William Chapman; Sherman, Stuart; Wolfson, Susan J. 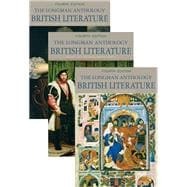 Key Benefit: The Fourth Edition builds upon the strengths of previous editions with its sustained attention to the context in which the literature was produced and its broadened scope of literature that includes the full cultural diversity of the British Isles. Key Topics: Includes canonical authors and newly visible authors. Extensive selections from previously underrepresented female writers are fully integrated. New "Responses" readings group works that were based on earlier writings to link works across time and place. "Perspectives" readings are broad groupings that illuminate underlying issues in a variety of the major works of a period. Market: For anyone wanting a fresh approach to the study and enjoyment of British literature.